Most rock bands develop respect not by fancy book-learnin� but by playing holes-in-the-wall for peanuts. 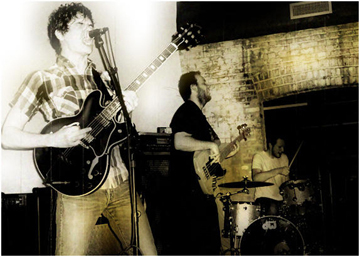 Then there�s Valhalla, a new local indie-rock three-piece whose members studied at Berklee College of Music, probably the most respected school in the country. (No offense, UNT.) Their educational pedigree may have had something to do with their recently landing gigs at some of North Texas� finest rock establishments. But it�s not all. Bassist J.B. Andrews, drummer David Greenbaum (the only band member who graduated), and singer-guitarist Austin Jenkins are sharing bills with the likes of Black Tie Dynasty, The Burning Hotels, and The February Chorus and are playing reputable venues for one chief reason: The music rocks. The band�s sound is raw and gritty, yet it somehow also has an unaffected lyrical bite that probably can�t be replicated by intuitive (read: untrained) players. There�s a moment in one of the Weatherford trio�s barn-burners, �Stop Your Heart,� when Jenkins taps out a few bars of a short, colorful phrase that�s more prog-rockish and John Scofield-ian than sloppy and hopelessly indie. Which brings up a good point: Indie-rockers aren�t as appreciated for their technique as much as their sense of melody and rhythm, taut lyricism, and ability to convey emotion. Too bad for other burgeoning indie-rock bands in town, the guys in Valhalla have those intangibles down, too. Jenkins� voice has that masculine, �80s Brit-pop edge that�s common to a lot of indie frontmen, but he never sounds anything less than self-assured. Being wishy-washy, his vocal tone seems to say, is for wimps. The three musos moved to Fort Worth about six months ago after Jenkins purchased a Weatherford warehouse that he�s since converted into a recording studio. The band�s debut, an eponymous five-song e.p., will be ready for this weekend�s shows, Friday in Austin at Emo�s and Saturday here at The Wreck Room. Sat w/Black Tie Dynasty, Faux Fox, and For Those Who Know at The Wreck Room, 3208 W 7th St, FW. 817-348-8303.